FALLEN GODS Celebrates Seven Years of Beauty and Madness… – Ce Soir Arts – Be inspired tonight! Our friends at the incredible FALLEN GODS (simply outstanding creator Alia Baroque and the lovely and gifted Elizabeth Tinsley) are celebrating a milestone: seven years of successful business and artistry. They just wrapped on what was called the Festival of the Sun, a grand series of events that included a photo contest for Fallen Gods God and Goddess; a Melee Tournament (! ); LOADS of free gifts; a Festival of the Sun Hunt and sales event; and the BEST party on the grid: the 7 Deadly Sins Anniversary Party. Wow. 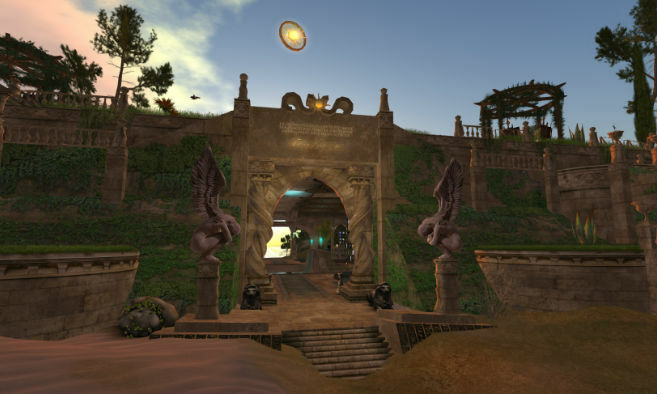 This celebration, which is not really over yet, is a wonderful thing for many reasons – such stability and creative energy in SecondLife should be celebrated – especially when the work is of such fine quality and interest. Indeed, the number of people who frequent Fallen Gods and participate in the many outstanding activities they host is large; it’s a varied group of role players and others who admire the quality of what is offered at Fallen Gods. From shapes, skins, and all sorts of avatar enhancements to furnishings and even buildings, Fallen Gods has an impressive and innovative stock. Regular readers will know this, but I’ll retell the story – mostly because I love to tell it. It’s a great story! The fact is that Alia Baroque is largely responsible for us having Ce Soir Arts in the first place. Aeon and I were wandering around one evening, kicking about some ideas about how we might share our love of the arts in SecondLife, and we decided to stop in at Fallen Gods to get a look at Alia‘s latest skins (we’ve loved Elementals for several years). While enjoying ourselves shopping, I literally ran into a display of some buildings that I had seen before – the Hall of Mysts, the Residence, and the Dome. These had been used as part of a special celebration a couple of years earlier. I remember standing there, my mouth hanging open, speechless. (If you know me, you know that something BIG is up if I’m speechless!) Aeon kept asking me what was up and when I told him we HAD to take the teleporter and go up to see these buildings, he was intrigued. We took the teleporter, rezzed each of the three buildings in turn, and explored. When we were in the Residence, I said to Aeon, “We need to buy all three of these.” He quietly agreed and said, “They’ll make for a great arts venue.” Mhmmm! So, we bought all three and rushed home. Next…we needed another sim. Our homestead was wonderful – and we’ll never truly give it up (family members live there now) – but it just was not meant for traffic. So…off we went to look for a home. Long customers of RGF, that was our first stop. 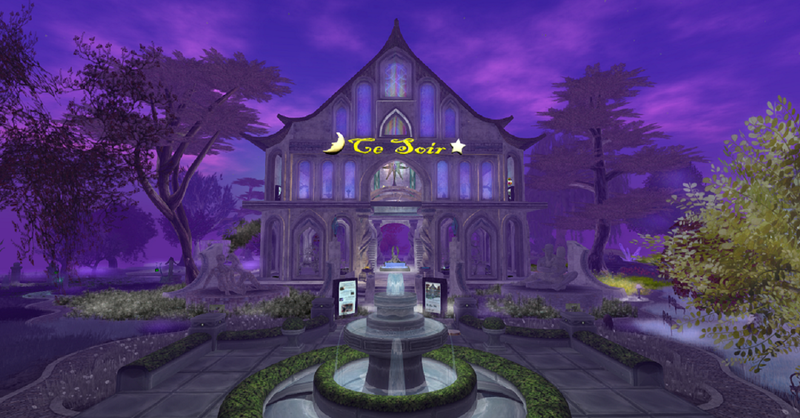 We just asked for the names of all the Full Sims presently available, and right off the bat, there it was: Ce Soir. That was it. We took it and moved right over there. We played with the base sim for a few days, but it soon came clear that we wanted to float the venue space above. Once that decision was made, Ce Soir Arts was created (well, the base of it) in one day. The rest took about two weeks, and we loved every minute of it! The Hall of Mysts was the centrepiece, becoming the main venue space: The Castle. The Dome became The Gallery and The Residence is now The Ce Soir Arts Theatre. Perfect! And now, as we wrap up celebrating 7 years of magic at Fallen Gods, we start thinking about what YEAR FOUR will look like at Ce Soir Arts. Stay tuned! We think it’s going to be quite spectacular! Below, our entries in the photography contest at Fallen Gods. We won the Elementals Award, which seems fitting since we’ve been enjoying this style of avatar (in some of our off-Ce Soir Arts moments) since 2009. We also have other of Alia’s avatars including Hybrids (we are sometimes these when we feel vampyrish…) and Oscar and Anna, a couple of classy steampunk characters. You’ll see both the Hybrids and Oscar and Anna in our Hallowe’en postings. Previous Aujourd’hui c’est mon anniversaire et j’ai de bonnes actualité à vous annoncer !